Cats can compensate for early degrees of hearing loss, so sometimes their human companions are unaware of the problem until complete deafness occurs. 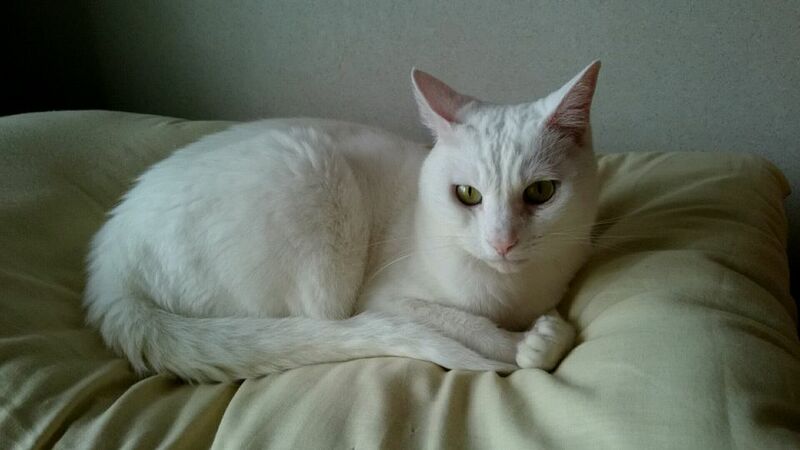 Pink or scaly areas at the tips of the ears (in white cats or cats with light-colored ears). Can be the beginning of a skin cancer called Squamous Cell Carcinoma, which is common to white cats and other cats with white ears. The third category of hearing loss exists in older cats, and is a combination of the two, resulting from nerve damage and the fusing together of the bones of the inner ear. Problems with ear mites, tumors, or infection can be fairly easily diagnosed by your veterinarian. However, for hearing loss caused by aging, a more sophisticated test, the (BAER) brainstem auditory evoked response test may be needed. Since hearing loss due to aging is not reversible, you may decide to help your cat compensate for his loss. There are a few things you can do to help your senior cat adapt to hearing loss. Make sure he knows you are in the area before walking up upon him. One veterinarian suggests turning a light off and on rapidly before entering a room. Put your hand on her or pet her when you are talking, and she will "hear" the vibration of your hand as you speak. Communicate in both verbal and non-verbal ways. Although not all forms of hearing loss are reversible, cats are extremely resilient and adaptable to their infirmities. Your gentle care and management will go a long way in helping them adjust to life without sound.